Last week, I was invited to speak at my synagogue as part of a lecture series about Pirkei Avot (Sages of our Fathers) – a compilation of sayings and wisdoms from Rabbis about moral and ethical principles. I was asked to select an adage that spoke to me and talk about its significance in my life. The following is a transcript of my speech. I think it’s always relevant, but particularly so due to Passover’s arrival next week. This is not just for those who are Jewish. I do believe that we all have struggles, we’ve all felt overwhelmed, we all seek an escape, we all have work that needs to be done…here are a few of my struggles and how I have managed them. For those of you who don’t know me, let me share a bit about myself. I’m an event designer, a producer, a marketing specialist, a cookbook author, a blogger, a pianist, a board member, a jewelry maker, a mother, wife, daughter. Phew. Who in this room has ever been asked the question, “What do you want to do when you grow up?” Let’s see with a show of hands. Yeah, I still can’t answer that question. I have always been interested in many things, which are never related to one another. At many points in my life, that has made me feel scattered, like I have no purpose, that I am constantly trying to sabotage myself or maybe I’m afraid of success. OK, I’ll be very honest, that feeling has been a near-constant in my life to the point where I feel overwhelmed and stuck. On Monday, we celebrated the first day of spring, though you wouldn’t be able to tell from looking outside! Snow? Really? What happened to “out like a lamb”??? Speaking of lamb…Passover is rapidly approaching. See? I can’t even focus in this speech! Passover celebrates our liberation from slavery and our passage out of Egypt. We gather around the table and retell the tale but I urge you to reflect and go deep. Connect to the story and make it personal. How do we each find meaning within the Liberation/Redemption celebrated on Pesach? We all have our own personal struggles. Some people face major challenges – cancer, domestic violence, hunger, homelessness…we may not all have such tremendous obstacles, but we all have moments of weakness, dark times, times of hurt. When I was in third grade, my classmate made sure to seek me out every single day to tell me how much the entire school hated me. Or how the whole school thought I didn’t brush my hair. When I was sixteen, I was forced to completely change gears from my path to become a pianist when I damaged the muscles in my hands and back. As a mother, I struggle on a daily basis. Just yesterday, I kicked myself for losing patience with my little five year old who was too tired to listen. And on the tenth time that I asked her to put on her shoes…the struggle is real! And everything feels so consequential when you are raising young children. Big or small, these dark moments are trying on us mentally, emotionally, physically. Especially when young children are involved. The enormity of them is sometimes too overwhelming and we feel like we can’t go on. The great Mishna sage Rabbi Tarfon wisely said, “It is not incumbent upon you to finish the task, but neither are you free to absolve yourself from it.” As I see it, we must not be overwhelmed by the enormity of life itself or our struggles, but we must engage with the task at hand and bit by bit, work towards our goal. Meaning, despite the pain, we must thrive for we can’t know the beauty of light without experiencing darkness. To appreciate the spring, we must survive the depths of winter. No matter what the turning point, we can choose to use those worst moments to our benefit. This is our crossroads, where we decide whether to fight on and achieve our own Exodus. But what is this enormous task of which Rabbi Tarfon speaks? And how do we find redemption? I think the ultimate task is existence itself which is why we can never achieve any sort of end-game. We just have to do what we can, and make it meaningful. Existence is a lofty thing and we cannot sustain it alone. We are a part of a chain, an ongoing historic process. We are not charged with the whole of existence, but we must play a meaningful part, pay it forward or transmit it to the next generation. That’s why we retell the story of Exodus at the Passover seder. To remember those who came before us, their pain and struggles and how despite it all, they managed to put one foot in front of the other and journey to freedom. The Seder is a reminder to do everything you can do to advance the process. And with spring comes renewal and new beginnings. Yet another reminder that we can’t get everything done in one cycle. Although we are human, we are like perennials – doing what we can, weathering the storm and then coming back stronger. Our redemption lies in continuity, in our shared history and bringing forth the next generation. That’s great, you’re thinking. Why don’t I just give up then? If I can’t finish the job, why start at all? Well, that’s what Rabbi Tarfon says: although you need not finish the task, you also aren’t free to abandon it. This isn’t dismissive as in “Why bother? Why even start?” It’s a challenge. What can you achieve that is meaningful? Haven’t you felt that before? Inaction is like a shackle that holds you back? I know when I’m down and focusing on the struggle, I am completely overwhelmed. Just when I want to give it all up is when I take a breath. It can literally be a breath. Or a break. Because we all need a bit of perspective. Only then can we properly assess the situation and figure out a plan of action. The moment you take that first step, you already feel liberated. Remembering that you’re not alone is a tremendous help. I’m not the first to struggle with my issues and I won’t be the last. I am part of the continuum. I am fortunate to have always had incredibly supportive people in my life. As a young child, I had amazing parents who nurtured me and helped me make my way in this world. When I came home from school, crying from being teased and bullied all day, my parents invested their time and energy into developing my self confidence and self esteem. Instead of getting involved with the petty stuff, they delved head first into building a strong and confident woman. They pushed me to be a good student, to practice the piano (sometimes 12 hours a day), to participate in enough activities that I would always have some friends, even if they weren’t at school. They helped me take a break from the social struggles so that I could take the necessary steps to becoming a worthwhile adult. It hurt, and it hurt a lot, to be teased on a daily basis. But I know that I really am stronger because of it. Instead of reacting or focusing on my bully’s nasty words, words I am sure came from their own place of hurt, I worked on myself and did the things I could do to change my situation, and in turn built a thicker skin that allowed me to compete – in school, at competitions and in life. In no way am I immune to hurtful words, but I now try to differentiate between words and their true intent. When my life path was radically altered, I could have just given up. 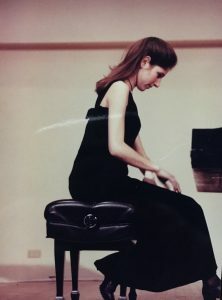 I had prepared for many years to get into Juilliard and become a professional pianist. I practiced 6-12 hours a day, I entered competitions, I attended Manhattan School of Music on Saturdays, I submitted myself to my mother’s incredible “torture” regimens to master pieces on the piano. When I realized that I had to give up my dream, I felt stuck. I wasn’t sure how to move forward. A dream shattered is hard to overcome. But, I did what I could. I applied to liberal arts colleges and basically started fresh. Guess what? I had a great college experience. I took classes because they interested me and discovered an incredible professor and mentor. True, my majors on the surface seem completely useless (African-American History and Theater). However, the freedom I enjoyed by pursuing my many interests and passions allowed me to open my mind and learn about new subjects and new people. Although I didn’t nail down my “destiny” I was able to narrow down my areas of interest and forge a new path for myself. When it comes to parenting, I feel a tremendous amount of pressure. How could you not? As parents, we are charged with raising humans! Ensuring that our society flourishes and thrives! For me, that has always meant that my greatest responsibility was to develop independent, confident and kind children who will grow into productive members of their community. But at what cost? I am a hardworking individual with goals and dreams of her own. Beside the daily struggles with shoes and homework, I am constantly up against the major obstacle – can women have it all? And the answer is…(drumroll) yes and no. I think we need to see the “having” or “doing” it all as another process. Never completed all at once or in one cycle. When my oldest was a baby, I was able to continue my work pretty much uninterrupted. When the second baby came, however, things were much different. And when we transplanted to New Jersey, everything changed dramatically and I found myself completely incapable in every facet of my life. I was overwhelmed with the move, a home renovation, suburban parenting, meeting and making new friends. Every few months, I break down and feel lost. Luckily, I have an incredible husband who loves and supports me. He seeks my success as much (if not more) than I do and is the first to step in when he sees me down. His advice is always on point, whether I am able to follow it or not! The important thing is that he forces me to focus not on my inability but on the practical small step I should take to move forward. “Take some time for yourself and make sure your head is clear.” Or “Create a schedule for your time so you can fit in everything you need and want to, then say no!” Despite my down moments, I have managed to launch a lecture series, write a cookbook and launch the next phase of my career. And as I look further out from my family, I am grateful to the safety net that I have built. Close friends, acquaintances and the larger community. It takes a village. Not just to raise kids, but to forge ahead in life. When I can’t take it any more, I have incredible friends who nudge me out of the dark. They encourage me not just with their words but with their actions, too. I have to share something funny. This morning, as I sat writing my speech, my water heater burst and flooded my basement. Yes, it was frustrating and guzzled up precious hours of my day, but I am so lucky that my parents and dear friends offered to help out. My builder quickly came to my aid and helped me get the ball rolling on fixing the problem. The bad news is that we need a new water heater. The good news is that it uncovered a wider problem with our water that is now on the mend. Even when I feel isolated, I know I am not alone. I can always reach out. That’s the crucial first step. And then comes the reminder that we are all part of the process and the continuum. So, don’t despair. Don’t let the enormity of your troubles or life itself take over. Lean into the discomfort. Make sure to build a support network so you can always remember that you are a part of a long chain. Take a breath. And then, slowly, make a plan. Don’t forget: the secret to success is taking the first step. As you look around your Passover table, take note that you are not the first to struggle. More important, remember that your struggle is not wasted. It is a teaching moment for the next generation, just as the story of the Exodus is for us.